We’d love your help. Let us know what’s wrong with this preview of Maggie's Kitchen by Caroline Beecham. When the British Ministry of Food urgently calls for the opening of restauran Amid the heartbreak and danger of London in the Blitz of WWII, Maggie Johnson finds her courage in friendship and food. When the British Ministry of Food urgently calls for the opening of restaurants to feed tired and hungry Londoners during WWII, Maggie Johnson seems close to realising a long-held dream. Navigating a constant tangle of government red-tape, Maggie's Kitchen finally opens its doors to the public and Maggie finds that she has a most unexpected problem. Her restaurant has become so popular that she simply can't find enough food to keep up with the demand for meals. To ask other readers questions about Maggie's Kitchen, please sign up. The year is 1941 in London and Maggie Johnson is trying to come to terms with the passing of her fiancé Peter. If dealing with her grief isn't enough, Maggie and everyone around her are in danger as they do their best to keep safe from the war that is going on around them. Maggie spent her days working in factory kitchens, but working under Mr Ferguson was not pleasant and Maggie desperately wanted to start up something on her own as she'd invariably had a love for cooking and food. And then when The year is 1941 in London and Maggie Johnson is trying to come to terms with the passing of her fiancé Peter. If dealing with her grief isn't enough, Maggie and everyone around her are in danger as they do their best to keep safe from the war that is going on around them. Maggie spent her days working in factory kitchens, but working under Mr Ferguson was not pleasant and Maggie desperately wanted to start up something on her own as she'd invariably had a love for cooking and food. And then when the British Ministry of Food had openings for restaurants to feed the people of London, Maggie jumps at the chance. But with so much government red tape to go through will Maggie's dream come true? Aussie author Caroline Beecham has written a BRILLIANT story which I thoroughly loved. Maggie's Kitchen is such a marvelous historical novel. With thanks to Goodreads for my copy to read and review. HIGHLY RECOMMENDED. The year is 1941. The place is London. Maggie Johnson is still trying to come to terms with the death of her fiancé Peter, killed in action. Part of her is holding out hope that the information is wrong. Meanwhile she gets on with doing what she does best, cooking and caring for others. Her concern ends up including her cousin Rose, twelve year old Robbie, who is battling to believe his missing father is okay, and the Polish refugee Janek. When The Ministry of Food calls for the opening of Briti The year is 1941. The place is London. Maggie Johnson is still trying to come to terms with the death of her fiancé Peter, killed in action. Part of her is holding out hope that the information is wrong. Meanwhile she gets on with doing what she does best, cooking and caring for others. Her concern ends up including her cousin Rose, twelve year old Robbie, who is battling to believe his missing father is okay, and the Polish refugee Janek. When The Ministry of Food calls for the opening of British Restaurants, Maggie is interested. She and Peter had dreamed of opening their own restaurant. Now that he is gone, can she do this alone? She resolves to give it a try and so Maggie’s Kitchen opens its doors. Not all is smooth sailing from that point. Complications arise with Maggie’s Kitchen but also with Maggie’s personal life. Maggie is an engaging and likable character. Robbie adds a bit of childish mischief. The whole concept of these British Restaurants during war time was something I had not heard about before so that was interesting, although at times I felt the reader got a bit overloaded with food sourcing and menus and such. There are some recipes for some of the meals at the end of the book, but I never felt inclined to try any of them. Others may. London, 1941 and Maggie Johnson was struggling with more than just her grief over the loss of her fiancé Peter. The constant drone of enemy aircraft, the mad dash to the bomb shelters, then the horror of what Maggie and her shelter companions would find once they were free to move around again – it was hard to remain positive in the face of such heartache. Maggie worked at the factory kitchens under the watchful eye of Mr Ferguson – never a compassionate man, he was a stickler for his workers be London, 1941 and Maggie Johnson was struggling with more than just her grief over the loss of her fiancé Peter. The constant drone of enemy aircraft, the mad dash to the bomb shelters, then the horror of what Maggie and her shelter companions would find once they were free to move around again – it was hard to remain positive in the face of such heartache. With the Ministry of Food rationing each restaurant, Maggie found she was unable to keep up the supply as her Kitchen was so popular. Having to close the restaurant on occasional days distressed her, so she sought alternatives. Twelve year old Robbie, a street urchin Maggie had met under unusual circumstances, and Polish refugee Janek were two who were influential in helping her with provisions. But the breaking of rules was frowned upon by certain members of the Ministry of Food – Maggie was threatened with closure if she didn’t change her ways. What could Maggie and her friends do to keep the popular Maggie’s Kitchen from closing? 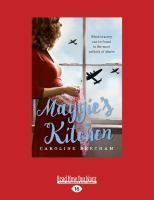 Maggie’s Kitchen by Aussie author Caroline Beecham was an absolutely wonderful read. I thoroughly enjoyed reading about Maggie and her staff (mostly friends and her cousin Rose); the lives of Robbie as he searched for his Dad and Janek and his fierce desire to return to Poland. There was heartache and sadness, but there was hope, friendships and love as well. Maggie’s Kitchen was filled with characters that were courageous in the face of such tragedy; there were light hearted moments and happy times as well. I have no hesitation in highly recommending this historical fiction novel to fans of the genre. It seems that there are many more compelling stories to draw out of World War II, which Caroline Beecham explores in her debut novel, Maggie’s Kitchen. Maggie’s Kitchen draws our awareness to the existence of government restaurants in wartime Britain, that were formed in a bid to ensure London residents were provided with hot meals, in a time of food rationing. 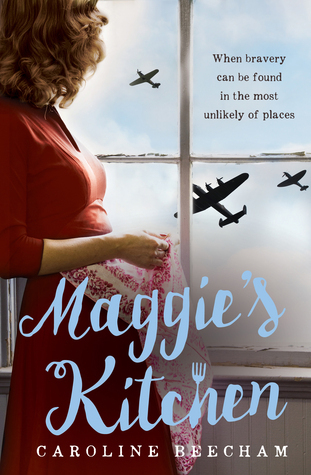 Maggie’s Kitchen is about one woman, Maggie Johnson, as she strives to make a difference during the perilous times of the Blitz. Maggie’s Kitchen is a delightful novel, that I really enjoyed. Although the time period and main setting is fairly grim, Beecham lightens the mood with her approach to the central plot and her selection of characters. I immediately took a liking to Maggie, in fact, I greatly admired her efforts and sense of resourcefulness in the face of adversity. Maggie is a woman who has an air of sadness and loss. Her fiancé died in the war and consequently her dreams of opening her own restaurant are put on hold. However, when Maggie answers government calls to help feed the London community, her aspirations to open her own restaurant are reignited. The road to working in her own restaurant isn’t easy for Maggie. Beecham uses this plot angle as leverage to make the reader aware of the pertinent issues of the time. These issues include food supply problems and various bureaucratic intervention that threatens the success of the government initiated restaurants. Maggie is a determined young woman and the reader is able to witness her growth as a person in the progression of the novel, as she finds the courage to rise above the challenges put in front of her. Maggie is a worthy heroine and a memorable character, but she is also supported by a set of secondary characters who are equally likeable. From the little street boy Robbie, to the Polish immigrant Janek, as well as Maggie’s work colleagues, each is presented a way that the reader does genuinely care about their wellbeing. The overall tone of the novel is just so warm and engaging as well as relatable, reflecting the day to day stories of life in wartime Britain. I really did love a couple of extras that were included in this book. The first was the quotes that adorn many of the chapter openings of the book. These quotes gave perfect insight into the thoughts of time, as many relate to the food restrictions placed on the British in this era. Secondly, there is the inclusion of a good selection of recipes at the end of the novel, inspired by Maggie’s Kitchen. It was a reminder of the meals I recall my Grandmother sharing with me, which gave me a wonderful sense of nostalgia as I read the recipes. Maggie’s Kitchen is a novel that is easy to settle into, kick back and enjoy. An original wartime story, with a hint of romance that I absolutely recommend. This book was such a delight! Not too heavy on the Historical Fiction and there's a hint of Romance/Chick lit in it too. The plot line might not be very appealing at first glance but I promise you it's amazing. It's not completely flawless by any means, but it's a very easy and light read that'll have you flip those pages like crazy. One thing I particularly liked about this book is Maggie's passion for cooking and opening her own restaurant. It reminded me so much of Tiana (from Princess and The This book was such a delight! Not too heavy on the Historical Fiction and there's a hint of Romance/Chick lit in it too. The plot line might not be very appealing at first glance but I promise you it's amazing. It's not completely flawless by any means, but it's a very easy and light read that'll have you flip those pages like crazy. One thing I particularly liked about this book is Maggie's passion for cooking and opening her own restaurant. It reminded me so much of Tiana (from Princess and The Frog, a movie I completely adore) and her determination to open up her own restaurant and cook for people and make her family proud. Maggie was a lot like her in many ways - fierce, loyal, and kindhearted. The ideal protagonist, if I do say so myself. Then we have the articulate writing that weaves the story together so brilliantly. The author basically had me salivating over the delicacies that were presented in the book. Couldn't help but sneak myself a slice of custard pie and a warm cup of tea that goes perfectly with this novel. I also wanted to point out the unlikely friendship that was formed between Maggie and Robbie. To think of it, she was more of a mother to him; cooking his favorite meals, allowing him to stay over for the night and rest. It was interesting that their bond was much stronger than anyone else's, and you understand why as you go through the book. Lots of friendship blossom as the book progresses. A bit of drama involved, but that's as far as it goes. It's amazing how the author is able to centre the story around the world war and the unlikely events that are occurring during that time. It brings about a new perspective to fans of Historical Fiction like myself. There's just so much more to the World War than air raids and tragedies. Maggie's Kitchen emphasizes on the fact that sacrifices are important, and that there is always hope even when society is collapsing. I would love to read more of Beecham's works. Is it too much to ask for a sequel (if there isn't one already)? I'd love to know what happened. Plus, the book includes recipes for all he meals mentioned in the story. How neat is that?! Such an amazing book. I highly recommend it to you kitchen-crazed bookworms, or just anyone in general. Far too much tell and not enough show. The story is very slow and takes forever to get going and when it finally does, it ends. Interesting time period, well researched, subject is original (I haven't seen another fiction book that focuses on food shortages and rationing in Britain during World War II), includes recipes, and most of the characters are likable. Advice to the author, let your characters tell their own stories by their actions and interactions with one anot 2.5 Stars. Tender, heartbreaking and intriguing, Maggie’s Kitchen serves up a slice of wartime life I haven’t before seen in a book. Feeding the masses, with tight restrictions applied by bureaucracy, called for resourcefulness, and Maggie has buckets of that. She’s a wonderful character, full of warmth and compassion, but not afraid to bend the rules where she thinks it’s best. 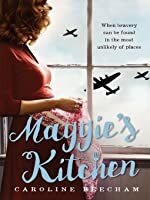 She’s a protector and a provider, and that comes out beautifully in many ways, from the way she takes young Robbie under her wing Tender, heartbreaking and intriguing, Maggie’s Kitchen serves up a slice of wartime life I haven’t before seen in a book. Feeding the masses, with tight restrictions applied by bureaucracy, called for resourcefulness, and Maggie has buckets of that. She’s a wonderful character, full of warmth and compassion, but not afraid to bend the rules where she thinks it’s best. She’s a protector and a provider, and that comes out beautifully in many ways, from the way she takes young Robbie under her wing, to the way she defends her cousin. The broader experience of war is shown through Robbie and Janek, both of whom are separated by loved ones, boosted only by hope, and loyal to the end. The quotes at the start of each chapter give insight into how difficult it was to make-do in this time – I found them fascinating and learnt one or two things as well. Maggie's Kitchen by Caroline Beecham is easy to read and extremely well written. It tells the story of Maggie opening her kitchen during the time of war. When bravery can be found in the most unlikely places. The British Ministry for Food urgently calls for the opening of restaurants to feed tired and hungry Londoners during World War 2. You'll hear all about Robbie, a street urchin, and Janek a Polish refugee. Maggie fights to keep her kitchen open during tough times but soon discovers that some sec Maggie's Kitchen by Caroline Beecham is easy to read and extremely well written. Maggie fights to keep her kitchen open during tough times but soon discovers that some secrets have the power to change everything. You'll enjoy reading the old fashioned recipes at the back of the book, a few of them which some of us grew up with and are still used today and also used in times of hardship when we have to make do and use the basic minimum of ingredients. The quotes used at the beginning of each chapter are useful and a delight to read making this book an enjoyable read. A Heart warming read that shows how WWII brought a nation together from creative recipes to taking in those in need. Join Maggie on her quest to do this. Okay so, initially the combination of a wartime setting mixed with the idea of cooking began to hit the snooze button in my brain. I could tell from the get-go that this book wasn't going to be my cup of tea. But it's a beautiful thing when a book opens up your mind to new genres and new experiences. Just like Maggie's Kitchen did for me. How amazing it is to become less closed off to certain genres and to now develop the ability to look a little deeper into what a story has to offer. Maggie's Kitchen offers to it's readers a story of bravery and spirit, fighting for one's dream despite the numerous obstacles threatening to prevent that. Beecham finds a gorgeous balance between all the layers presented to readers in this story; the threat of war, the strength of bonds between friends and family, a little bit of romance and the sheer determination of all characters. By balance I mean that each layer or device has it's own influence on the plot in just the right way that it keeps you hooked the entire time. Not in a confronting or surprising way, but in a gentle, subtle and uplifting way. You guys know how much I love strong protagonists who, hopefully, fight against stereotypes and don't act the Damsel-in-Distress. So I was pleasantly surprised when I was introduced to Maggie Johnson. Her strength in the face of opposition but also her willingness to accept her weaknesses and know when she needs the assistance and wisdom of her friends makes her the kind of character I could connect to. I felt Maggie's experiences, her wins and her losses, her desperation. And that's what makes for a story that someone can enjoy. This story promises historical fiction but it is not too strict on that. There is just enough of it to awaken you, the reader, into what times were like back then. Really, this is a book about life and all the curve balls it throws at you. Maggie's Kitchen is a wonderful story about Maggie Johnson her need to help and learning to survive during the war. It is a touching tale of love, life, war, hope and courage. Maggie has a strength that is shown by her courage and her ability to keep calm and her ability to carry on no matter what has happened in life. I found this a book I just didn't want to put down from the very start to the end I was drawn into Maggie's life and carried along on her journey. Reading this book touched on p Maggie's Kitchen is a wonderful story about Maggie Johnson her need to help and learning to survive during the war. I found this a book I just didn't want to put down from the very start to the end I was drawn into Maggie's life and carried along on her journey. Reading this book touched on parts of the war that I guess are unknown to most. We hear not much about how it really had an impact on the lives of those still needing to carry on. The friendships in the book are joyful and add a touch of happiness to a horrible time. In essence, Maggie is a helper, always putting others needs at a level of priority whether she knows them or not. It is this helping spirit that leads Maggie to respond to the government’s call for caterers In Maggie’s Kitchen, Caroline Beecham presents the touching story of Maggie Johnson while highlighting in intricate detail the tumultuous and precarious times of WWII in London; from food rationing to life underground following raids, the enormous loss of life to the uncertainty of the future. I enjoyed Maggie's Kitchen. It is a historical fiction however I would also class it as chic lit. I thought the book was well written and the characters were generally well written but without much depth. I did find Robbie had a bit too much understanding of life and was able to read situations a bit too well for a 12 year old, even taking into account how war makes people grow up quickly. I really enjoyed the food through I received an advanced copy of this book in exchange for an honest review. I enjoyed Maggie's Kitchen. It is a historical fiction however I would also class it as chic lit. I thought the book was well written and the characters were generally well written but without much depth. I did find Robbie had a bit too much understanding of life and was able to read situations a bit too well for a 12 year old, even taking into account how war makes people grow up quickly. I really enjoyed the food throughout the story, the excerpts from the British War Council and the strategies to stretch rations. This was an enjoyable book about Maggie who runs one of the kitchens set up by the British Government in WWII. Caroline Beecham could have done more with this book though. She could have used the customers of the restaurant to dig more into every day life during the first years of the war in London. It focusses a lot on the food and there is a bit of a love story in there too but it lacks atmosphere and depth. The added recipes are nice. I did enjoy this book but it was just about 3 stars in my o This was an enjoyable book about Maggie who runs one of the kitchens set up by the British Government in WWII. Caroline Beecham could have done more with this book though. She could have used the customers of the restaurant to dig more into every day life during the first years of the war in London. It focusses a lot on the food and there is a bit of a love story in there too but it lacks atmosphere and depth. The added recipes are nice. I did enjoy this book but it was just about 3 stars in my opinion. Much melancholy portrayed in a time fraught with danger and stressful circumstances faced by each of the characters in the story. Loss and second chances, turmoil and success. A chaotic time with each character thrown together in wartime, where their everyday was filled with danger, trials, secrets and discoveries. Maggie's Kitchen by Caroline Beecham was riveting reading from the first page and kept this reader glued to the story till the finish. Advanced Review Copy received from Allen & Un Much melancholy portrayed in a time fraught with danger and stressful circumstances faced by each of the characters in the story. Loss and second chances, turmoil and success. A chaotic time with each character thrown together in wartime, where their everyday was filled with danger, trials, secrets and discoveries. Maggie's Kitchen by Caroline Beecham was riveting reading from the first page and kept this reader glued to the story till the finish. Well I love reading, I love books and I love anything about food. So this covered all my loves! What a great read. I found it started a little bit slow and built up. The subject matter was very interesting and being set in the World War Two era you felt the hardship and tough times those who lived through it felt. But there was also love, friendship, family, happiness and more. Very much enjoyed this book. I grew up in East London on tales of my mum’s life during the war. Great story, enjoyable characters and a lot of historical detail. Thoroughly recommend this as a book to curl up and be comfortable with - this book should come with cushions, blankets, hot chocolate and a roaring fire. Loved it. I really enjoyed Maggie's Kitchen - an easy read that takes the reader into the everyday lives of Londoners living through World War ll. I didn't know about the food kitchens so found it fascinating to read into a different perspective of that period and resourcefulness of people running the kitchens. Recipes at the back were a bonus. This novel has a great combination of historical interest (set in London during World War II), community spirit, gentle romance and drama. The author's descriptions are vivid without being verbose and capture the spirit of this era. A thoroughly enjoyable read! I loved this first book by Caroline Beecham. Her way of writing is very detailed, poetic, engaging and evocative. So many courageous people ready to endure very arduous and unfortunate situations. The underlying food scenario is really appreciated! I must admit that the end did not satisfy me much. I hope the writer is working on a sequel and that is the reason of the, in my idea, a little abrupt ending. I would love to read another book about these same characters and the new joys and struggles I loved this first book by Caroline Beecham. Her way of writing is very detailed, poetic, engaging and evocative. So many courageous people ready to endure very arduous and unfortunate situations. The underlying food scenario is really appreciated! I must admit that the end did not satisfy me much. I hope the writer is working on a sequel and that is the reason of the, in my idea, a little abrupt ending. I would love to read another book about these same characters and the new joys and struggles they are going to face. I received this book as a promotion from the author, bookstr and the publisher Allen and Unwin. Although not one of the best books I have read, I really enjoyed it. Maggie is caught up in the hard times of the war. She has a talent for cooking and is convinced by a friend to apply to the Ministry of Food to open a restaurant to help feed the starving workers. She is continually faced with many obstacles but battles through. Finding friendship and love on the way. Thank you for the chance to read I received this book as a promotion from the author, bookstr and the publisher Allen and Unwin. I was soooo surprised when I received an email telling me that I had won this book via the Goodreads giveaway I had entered. It took about 5-6 weeks to arrive. When my sister handed me a parcel addressed to me, I was thrilled. And what did I find inside? Not 1 but 2 books. Yes, they sent me another book, an advanced copy no less! Elanor's Secret by Caroline Beecham, due to release in May 2018. I really enjoyed it and I recommend it to anyone who likes historical I was soooo surprised when I received an email telling me that I had won this book via the Goodreads giveaway I had entered. This was an easy and fairly enjoyable read. I was impressed by the extensive research that had clearly gone into the book, with fascinating details about wartime cooking and rationing. I liked the inclusion of quotes from various historical documents at the start of each chapter. It was an undemanding read, with a pretty light plot and simple characters, but enjoyable nonetheless. I did think it ended quite abruptly, with some loose ends not resolved. Just finished this book and I loved it! A sensitively written book with the added extra of wartime cookery recipes and information. Creating a story around this unknown part of history was very clever and the characters live on long after you finish the book. I would love to read about them again or perhaps even see them on the screen - it's such an interesting story and would make a great TV drama.